Government should nationalise oil and gas discoveries, such as the recent deep-water oil and gas find off the South African coast by French oil company Total, leader of the Economic Freedom Fighters (EFF) Julius Malema said. Malema was speaking during the debate of President Cyril Ramaphosa's State of the Nation address, where he commented on the Total discovery announced last week. The president dubbed the find as a "game changer". "Whether you like it or not - we are extremely encouraged by the report this morning about the Brulpadda block in the Outeniqua Basin, which some have described as a 'catalytic find'." "This could well be a game-changer for our country and will have significant consequences for our country’s energy security and the development of this industry," Ramaphosa said last week. 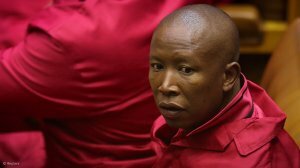 But on Tuesday Malema said the president neglected to explain that 90% of the oil and gas discovery would benefit foreign companies. "We demand all oil and gas discoveries must be nationalised," Malema said. "Oil and gas must be declared a national asset." Minister in the Presidency responsible for planning, monitoring and evaluation Dr Nkosazana Dlamini Zuma also commented on the discovery and proposed that the profits be channeled to a catalytic sovereign fund, for the current and future generations to benefit from the county's "finite resources". "We must ensure the wealth the nation holds benefits all and not just a few," she said. Bloomberg previously reported that the find - estimated at about 1-billion barrels – could be enough to supply SA refineries for almost four years.